On New Year's Eve, it's traditional to eat lentils. 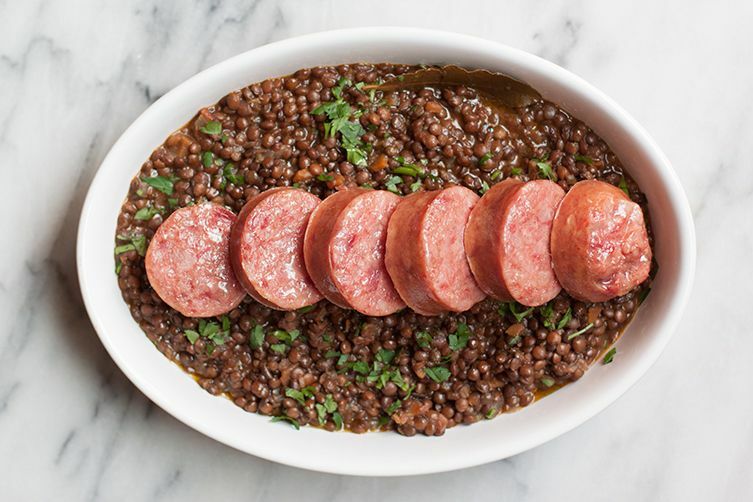 The little coin-shaped legumes supposedly bring good fortune, namely in the form of money, and, on the last day of the year, are usually served with cotechino (pictured below), a soft, gelatinous boiled sausage that's typical of northern Italy. But since this has to be one of the simplest and most useful recipes ever, why wait for just one day a year to enjoy it? Ever since I tried Rachel Roddy's recipe for lentils (which is more or less this one, though she adds garlic, a good idea, and a leek and doesn't use the bay or rosemary) from her Roman cookbook, it has become a favorite. I follow her advice by making sure I have leftovers so that I can reinvent them in various ways. Once you have a batch of this simple stew on hand, you can use the lentils for so many things: half-purée them and add a swoosh of olive oil for a hearty, creamy and delicious soup; stir them through freshly boiled spaghetti and you have what I like to think of as vegan spaghetti bolognese; or—my favorite solution to weeknight dinner—top them with a crisp-edged, soft-yolk fried egg. Brown lentils are typically used to make this stew, as brown and green lentils are firm and retain their shape when cooking. Red or yellow lentils are softer and faster-cooking, with the tendency to fall apart into a thick and wonderful mush when cooked; these are better suited for soup, sauces, or dips. 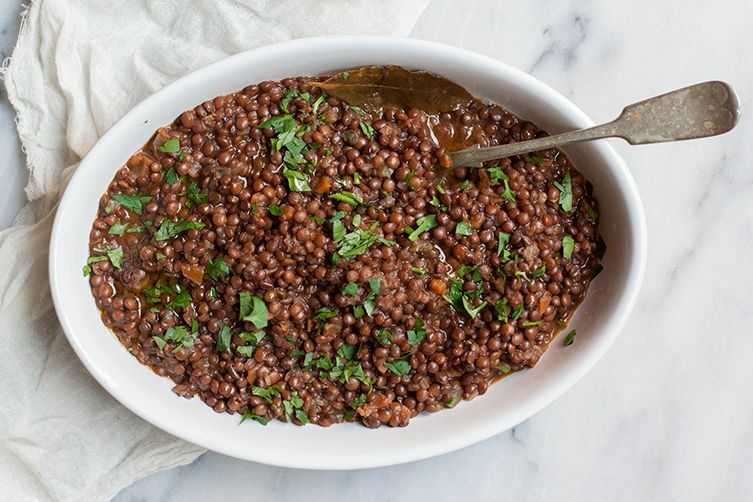 Many will say there's no need to soak lentils at all, but Italian recipes always call for soaking—usually from somewhere between 2 to 12 hours—and this reduces the cooking time significantly. Don't add salt until the very end or the lentils will remain tough and hard despite hours of cooking. 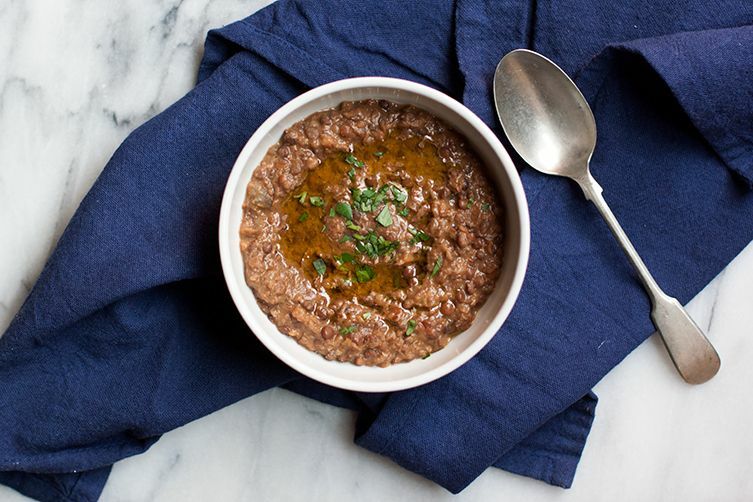 The lentils keep well in the fridge for the better part of the week, though they tend, like all legumes, to absorb their liquid (and its flavors) the longer they are in the kept. When reheating, add a splash (or more) of water to loosen and revive the mixture, depending on how you're re-inventing them. Since lentils on the table represent coins, the more you eat means more money in the new year. So you may even want to make a double batch.